I encountered this Green Heron — one of my favorites in our wetlands — perched high in the beautiful cypress trees, stalking its dinner during the approaching dusk. He sat with such intense focus (that face! ), that I admired in silence for the entirety of his watch. But this guy wasn’t just watching; he was most likely waiting. 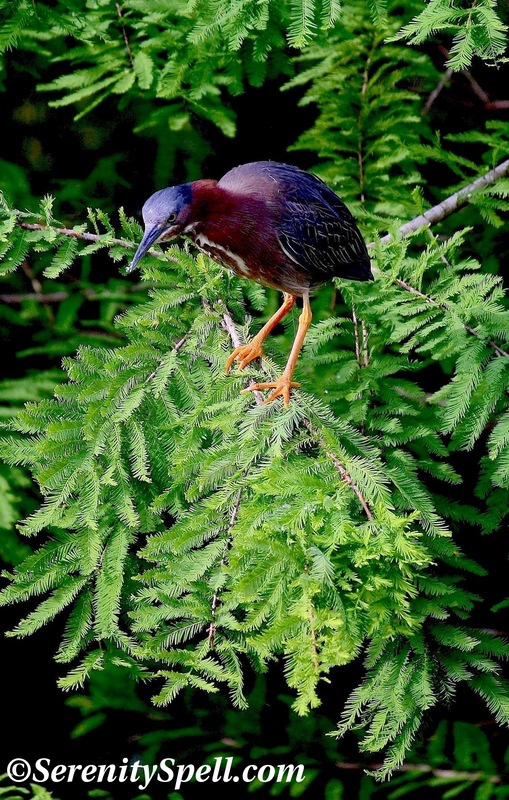 Green herons will often drop bait onto the water’s surface — including live insects, berries, twigs, or feathers — to attract fish. The more curious the fish…the more likely they’ll be dinner at the quick thrust of the heron’s sharp bill. This hunting technique, and use of tools, has earned Green Herons the well-deserved distinction as one of the world’s smartest birds. When I hear their signature kuk or kyow, I search for these shy guys and their moppy crowns, in the hopes of catching them hunting. Click here to listen to their calls! 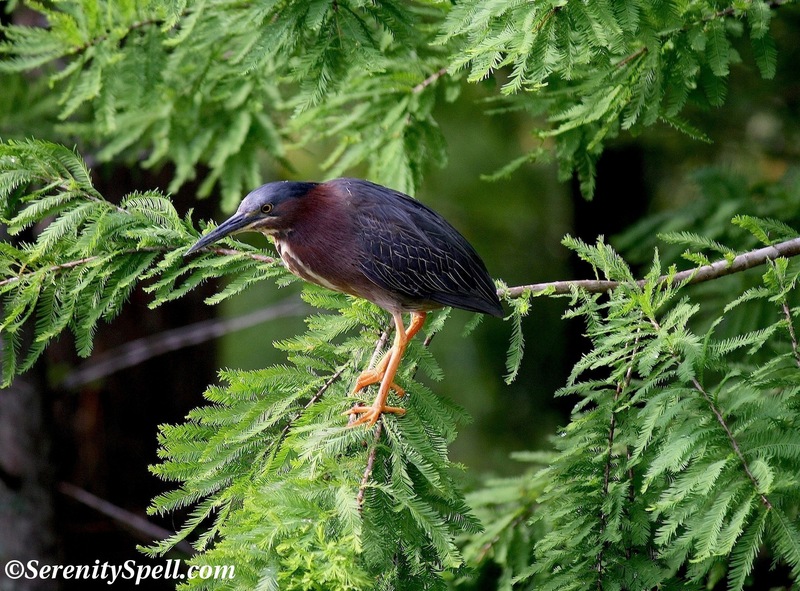 Green Heron hunting in the wetlands… FOCUS! Green Heron eyes a meal in the wetlands… PATIENCE! I nominated you for the Super Sweet Blogging Award. 🙂 Congratulations! Beautiful post, by the way. I’m so jealous of your photography! Thank you, and I’m glad to have passed on the award to such a deserving recipient. 🙂 I think your models help, but it’s your talent with the camera that really helps them shine. You’re so very kind… ♥✿♥!! What a beautiful scene – just gorgeous! It really was lovely…. I cropped the scene to highlight the heron, but the cypress and the swamp, oh my! JUST GORGEOUS. It is wonderfully lovely with the beautiful cypress as a backdrop for this pretty heron. They actually drop bait?!? Amazing. Beautiful photos, as always. Isn’t that amazing? One of the few tool-using birds (similar to crows). But to use that tool to FISH…! Where’s the “love it” button? 😀 The color!! Wow! Aw, you’re so sweet! It was a magical scene… I LOVE cypress trees — and while I cropped the image to highlight the heron, the whole scene, with the swamp, the trees, and the bird, was just perfect. I loved the look of concentration on the heron’s face. I had no idea that they used strategies to lure fish to them. Now I wonder if each innovates its own lures or whether its “cultural” in the sense that the use of specific lures is taught from parent to child. Isn’t that face *amazing*?! That’s what caught my eye, too… The complete look of focus, concentration. Very interesting point, too — whether they pick any ol’ lure available in their environment, or learn it from past generations. I’ve heard many species have innate learning and tracking mechanisms built-in at birth; perhaps this is one of them? I see purple and green… never knew birds hunted that way…thanks. Heh!! Thanks…. When you see them, there is an overriding deep green sheen. But there are many types of herons and egrets — and even those that border the line of heron/egret — so perhaps they just had to give it a label! I always try to catch one in the process of “baiting” — and here, I think I *just* missed it… He was waiting for his catch! Oh no!!! Don’t they know to stay away from the extra-fancy pretty fish? I love the setting in these images. And I had no idea this species actively “baits” fish so I learned something new. Thanks! I cropped the image, to highlight the heron and his concentrating face… But the bigger scene, with the cypress and water was just lovely. I usually catch them at this point — perched and actively focused on a specific point, fishing. They don’t wade and search like other herons (as much). But sadly, I’ve never caught one in the *process* of baiting! Beautiful photos! I would love to get to see them first hand! that is a stunning bird – made even better by your brilliant photographs! Had no idea these herons laid traps fit the fish. Brilliant! Wow downloaded the new ios6 for my iPhone and this is where it put me. Weird. BUT these photos are spectacular ! How STRANGE! It put you here? What’s it trying to say…??? I thought so too ! Anyway, it is cool as I watched a youtube video with one with a piece of bread that kept putting it in the water, then taking it out baiting the fish. Last grab was the fish! That’s insane. I have YET to nab one in action… It’s always right after they drop the bait!